... and so Leni recently visited an indigenous tribe center in Iligan City, and was so impressed with how clean the place was. But she was upset that she saw the children were barefoot (which probably explains why the inside of the center was clean in the first place because slippers were not allowed). With that in mind, she went back to Manila, and called an emergency meeting of her top advisers in the fields of economics, athletics, biology, kinetics, anti-poverty and social studies. She described her experience in Iligan, and she made an extemporaneous speech about the plight of the children, and the ill-effects of being barefoot in their psyche. She implored all the highly paid consultants and experts that were gathered, to wrack their brains, and pour their hearts out, just as she is pouring her bleeding heart into what she saw. She wanted the experts to come up with analytics, with in depth studies, with simulations and and cross-referencing. She even requested her contacts for foot experts from the houses of Ferragamo and Manolo Blahnik in a teleconference, to aid the experts in the dilemma that they are confronted with. The VP was in her element in the brainstorming session, which lasted two full days. She dug through history, through her own personal experience, through non stop phone consultations with friends, relatives, advisers, sponsors, benefactors and Bolet. It was one of the most poignant and one of the more stirringly emotional moment in OVP lore. After which, the OVP called an emergency press conference, to eagerly announce their action plan after that breakthrough session. 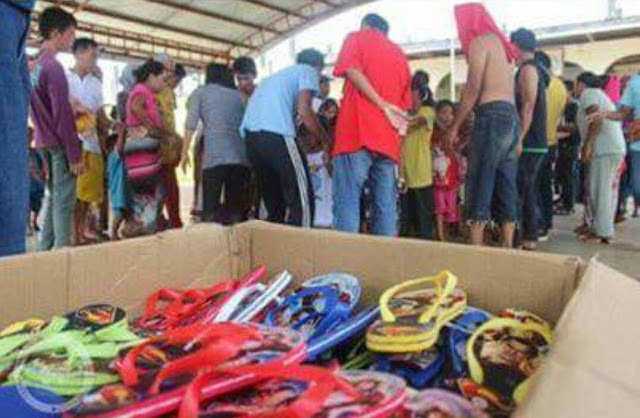 As proudly announced by Leni herself, the OVP brought 200 pairs of shiny, shimmering, splendid slippers from Baclaran worth P300 each, and ordered it shipped immediately to Iligan City. Let us repeat it as this is one gigantic leap forward in the annals of Philippine Politics -- 200 pairs of slippers were immediately made available by the OVP after a thorough deliberation and careful study by experts, for shipment and distribution to an indigenous tribe center in far away Mindanao, in a matter of 3 days. People of the Philippines, your Vice President at work! How lucky we are as a nation! hahahaha love this article! what an outstanding accomplishment really of VP Leni for the laylayan most of her projects is below this level -laylayan...pinag isipan talaga!